It's easy to create elegance on your showroom floor with your display units. By creating a custom built-in display design, you can attractively present your most precious merchandise, like jewelry, antiques, or collectibles. The Glass Front Wall Unit Displays features a large 63" vertical glass display area, which provides full vision for customers to examine the inventory they are purchasing. The sturdy 3/4" slab end construction, 5 adjustable 1/4" glass shelves, and 1/4" glass sliding door help provide retailers with an easy way to stock and present inventory. Displays also features white back and deck, heavy duty steel standards and brackets, and brushed anodized aluminum door track. The gray low-pressure melamine laminate surfaces are designed to match our gray display units. Optional light kit and lock are sold separately. Overall size measures 84"H x 18"D x 48"L. Wood crating for secure shipping is included in the price of the case. 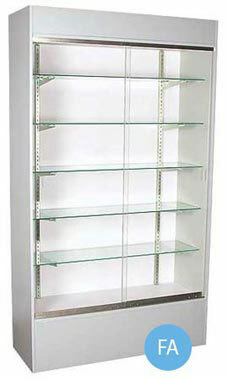 Our wall unit display cases are fully assembled and available for immediate shipment.